Twin Size duvet cover 90" x 68", pillow covers 20" x 26"
Full/Queen Size duvet cover 90" x 90", pillow covers 20" x 26"
King Size duvet cover 90" x 104", pillow covers 20" x 36"
Our duvet covers act like a giant pillow case for your down comforter- making it the perfect solution to protect and increase the life of your comforter. Machine wash with cold water; Do not bleach; Tumble dry, low heat; Iron, Medium; Do not dry-clean. Note: Actual color may vary from the color on your screen due to monitor color restrictions. 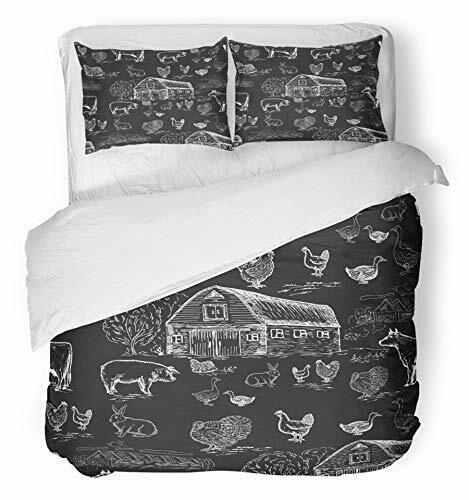 The Twin Size Includes: 1 piece Duvet Cover 68"x90"(172x228cm) ,2 piece Pillowcase 20"x30"(51x76cm). Machine washable in cold, gentle cycle, dries quickly on tumble dry low temperature. If you have any questions about this product by Emvency, contact us by completing and submitting the form below. If you are looking for a specif part number, please include it with your message.